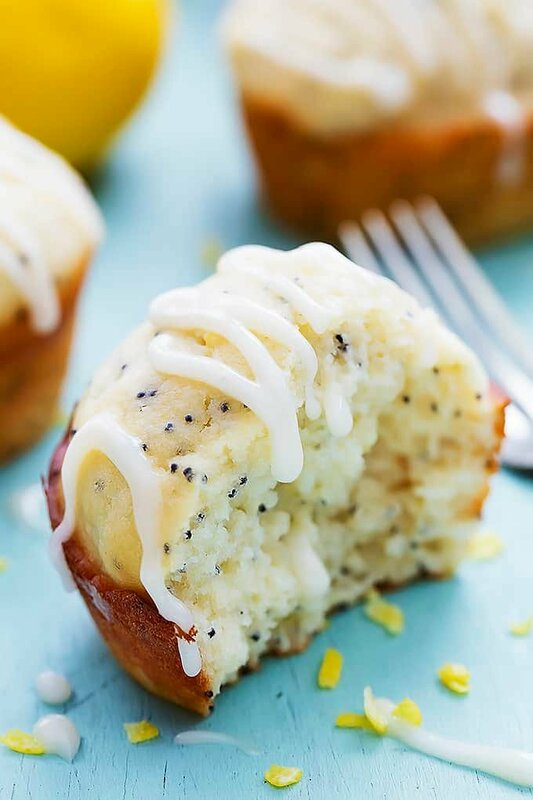 Super moist Lemon Poppyseed Muffins make with greek yogurt – topped with sweet and tangy cream cheese lemon icing! Need to up your breakfast game with some new muffins recipes? Try Blueberry Cream Cheese French Toast Muffins, Flourless Banana Blender Muffins, and Triple Chocolate Muffins. 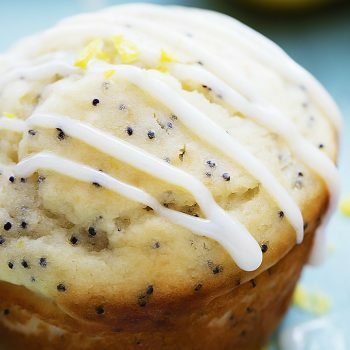 Okay, it’s true, everyone and their dog has a lemon poppyseed muffin recipe – I’m not claiming to re-invent the wheel here. 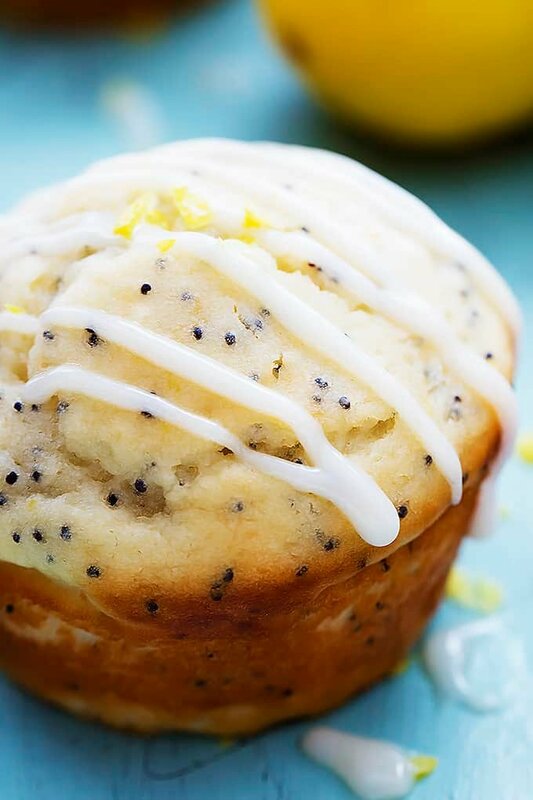 Lemon poppyseed muffins are a classic. But this recipe is my absolute favorite and as your personal source for yummalicious recipes, I am committed to sharing any recipe that makes me say “mmmmmmmmmmm!!!!!!”. Which, obviously, this recipe does. This is actually my ever-so-slightly tweaked version of my mother’s lemon poppyseed muffin recipe. She made it will oil, which I swapped out for plain fat free greek yogurt. By now you know that is one of my go-to absolute favorite baking swaps. The greek yogurt adds protein and a LOT of moisture, and replaces the fat from the oil. I love it. I also added a rich and tangy lemon cream cheese glaze because, well…. does that even need an explanation?? I mean, it’s FROSTING. Everything is better with frosting. 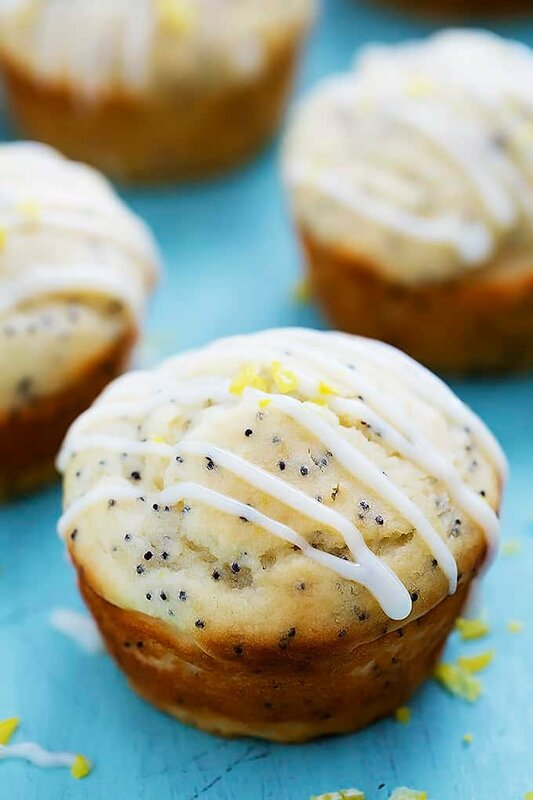 Super moist lemon poppyseed muffins make with greek yogurt - topped with sweet and tangy cream cheese lemon icing! Preheat oven to 450 and grease a muffin pan. In a medium bowl whisk together flour, baking soda, and salt. In a large bowl cream together butter, sugar, eggs, vanilla extract, lemon zest and juice, and greek yogurt. Add dry ingredients to wet ingredients and mix until combined. Stir in poppyseeds. Fill muffin tins about 2/3 full with muffin batter. Bake for 12-16 minutes until an inserted toothpick comes out clean. Allow to cool on a wire rack. To make the icing cream melted butter and cream cheese for 2 minutes until very fluffy. Add powdered sugar and lemon juice and mix well. Taste and add more lemon juice if desired. Drizzle icing over cooled muffins. (If icing is too thick you can warm it up in the microwave for a few seconds ) Serve immediately or store at room temperature in an airtight container for up to 3-5 days. Yummy! These would be awesome! These look perfectly moist and delicious! Hi – I’m using all American measuring cups, spoons, etc. Hope that helps! These muffins look fabulous. Just double checking..”bake at 450″…that seems a little high to me. Thanks. Love your recipes! Hi Tiffany, I am excited to try making these muffins for my daughters confirmation tomorrow. She loves lemon and cream cheese frosting so they are perfect. Do you think I could make mini muffins instead because we will have lots of food and people might want a smaller portion size. How would you adjust the temperature and time? 450 was way too high. they were burning. took them out at 8 mins ANd they are a bit too dark brown. oops. will lower the temp next time. i licked the batter spoon and it tasted delish. Thanks for your feedback, Joey! I usually use whole wheat flour for everything – do you think this could be made with whole wheat flour? Hi Skye – the thing with using all whole wheat flour is that the end product will be much more dense so it depends on whether you are okay with that. If you’re open to it, I’d suggest trying half whole wheat and half white, but it’s up to you! I may made these and they did not turn out at all. They were completely flat in the middle. They tasted incredible but looked terrible. I’m wondering did you use plain or self raising flour? Baking soda and baking powder are not the same thing are they? Baking soda is an acid and baking powder is a rising agent. Which one specifically do you use? In addition, you dont want to oVermix. That can also cause the finished product to “fall.” . They look amazing! I can’t wait to try this recipe. Can you tell me if you use salted or unsalted butter, please? thanks. Hi Naoko – I used unsalted, both would work though! I tried these the other day and they are DELICIOUS. I had never baked with greek yogurt before and feared they would turn out a weird texture. The texture is incredible though! I’m so glad I found your recipe. One thing I’m going to try next time is add a little more lemon juice to the muffin batter to make them a little more lemon-y. Now I have a lot of extra lemon icing – any suggestions what to make so I can use it up (other than more of these muffins, which I will be doing soon as well!)? I would slather that icing on a sweet bread like almond, strawberry, or poppyseed, and it would be amazing on scones or pancakes! Good, but added extra lemon juice and lemon extract for more lemon flavor. Also only used 2 cups powdered sugar for frosting and still had too much, 1.5 cups would be about right. I made these last week, and they are incredible!!! I did add a little more lemon(2 TBSP), and mine turned out perfect! Hey! I made these and they taste pretty good–not too sweet at all! My muffins, however, didn’t come at as moist as yours (look) even though I only baked them for 12 minutes. Do you know why that might have happened? (I might have beat the wet mixture too long for example.) Also, I only used 2 cups of powdered sugar but the icing was very opaque and thick. What are some tips on making icing? Thanks! Hi Sandra! I think it’s very possible that you overmixed the batter – try just mixing until dry ingredients are incorporated and no longer. Also for the icing, a great tip is to pop it in the microwave for a few seconds to get it nice and runny, this makes it perfect for drizzling or dipping! These cupcakes are delicious! I made the batter with about 1/2 tablespoon more lemon juice than the recipe calls for and the cakes turned out fluffy with a noticeable hint of lemon. For the icing I used only 1 cup of powdered sugar and 2.5 teaspoons of lemon juice. I also added a teaspoon of vanilla extract. This made the icing a little less sweet and more flavorful/tangy, but it was still a very sweet icing. I will definitely be making this recipe again! Is this volume enough to bake this in a bundt pan? Your recipe is wonderful! I did not make the icing, but I did try the muffins, then made them again, then started playing around with other flavors, and just today I baked lime and coconut muffins (same amount of lime juice and zest as the recipe says for lemon, but 1/2 cup coconut flakes added to the batter), and those turned out wonderful, too! Your recipe gave me courage to experiment. Normally I am very anxious about experimenting, but the texture of your original is so perfect that it made me feel braver, and each version I tried turned out perfectly every single time. Thank you for sharing! Do you have to use poppeyseeds for them to turn out? 5 stars! These came out wonderfully! I even replaced half the flour with whole wheat and reduced the sugar by half in the icing. Thank you! These are on my list to try when my lemon extract is ready to use next month. I’m hoping to replace the lemon zest with it. I made these and they came out amazing! I didn’t have powdered sugar so I couldn’t make the icing but they were still so good! I was wondering if I wanted to add raspberries would I have to adjust any of the ingredients or the bake time? Hi McKenna! so glad you liked these! You could definitely add some raspberries, you shouldn’t need to adjust the baking time. The recipe looks divine! I don’t want to mess with it the first time (maybe add a bit more lemon juice based on comments). So, I bought some almond flour on a whim – do you think I could work it in here? Hi Mack! I actually haven’t baked with almond flour before but it’s worth a try? I’d love to hear how it turns out if you give it a go! I’m guessing for the icing it’s supposed to be 3/4 cup powdered sugar? Because I just made it like it’s written and the icing was a disaster. It’s disgusting and isn’t even the same texture as an icing should be. Trying to spread it on the muffins it just falls off. Pretty sure this recipe has it written wrong. I found some poppy seeds on clearance at Target and I have never baked with them before. But for the clearance price I figured why not! I bought plain yogurt though NOT Greek yogurt. Will it still work the same? Hi Mary! Oh I love poppy seeds in baked goods, I have a new recipe coming soon that you will have to try!! As for the yogurt, I haven’t made these with regular yogurt but I think it will work, I reduce the amount to probably 1/2 cup. But if you have sour cream that works as a perfect substitute actually! I ended up using the same amount of plain yogurt. They tasted so good! Now I’m wondering if I could make the same exact recipe without the lemon zest and juice and add in chocolate chips for chocolate chip muffins? They were so moist I’d love to use the same recipe for other flavors! These just came out of the oven and i CAN NOT wait for them to cool! I had to exercise some serious self control to stop myself from eating all of the batter. It was just so good! My mother loves poppyseed anything and I made this for her birthday yesterday. Amazing! I love that they aren’t too sweet, but the icing makes the difference up (if you need it), and the lemon adds such a wonderful kick! I’ll be keeping this recipe around, thank you! Do I need to adjust the baking time if I’m using mini muffin tins? I made these muffins today & they were quite nice. It was my first time making muffins from scratch too! I let these in at the recommended temperature and left them in for an in-between cooking time of 14 minutes. They tops came out a little crispy and the inside was still soft. I liked the tops like that, but I know typically the muffins are super soft all around. I also doubled the amount of poppy seeds because I love the bite they add, I wish I added more. I had no almond extract so I used 3 tablespoons of amaretto (very light, so not noticeable really). Next time I will also add more lemon zest and juice. I didn’t feel that these were too lemony. They were also small. I know muffins do not do well with too much batter in the tin, but I would like to try making the big ones once I get the hang of it. Overall enjoyable however! Love the photographs! I made these muffins yesterday. They turned out awesome (I used white whole wheat flour). I served with a light berry sorbet. Complimented each other nicely. I do wish there was a calorie count per muffin, would be helpful. These were really good! However, I reduced the temp to 425 and they still got just a bit burned on the edges. Next time I would do 400 for 12 minutes, and check if they needed more time. But delicious recipe! Thank you! I made these for the kids this morning. I accidentally added 1 1/2 cups of flour instead of 1 1/3 (the print was just so tiny!). They turned out a little more like a cornbread muffin, but they are still really good. All the reviews just said how moist they were, so I was super-excited to try them. After my first bite, I was disappointed thinking I had overbaked them. So I checked the recipe again and discovered what I had done! I will definitely try these again with the correct flour measurement! Bummer!!! They weren’t bad enough for us not to eat every one of them! Ha! 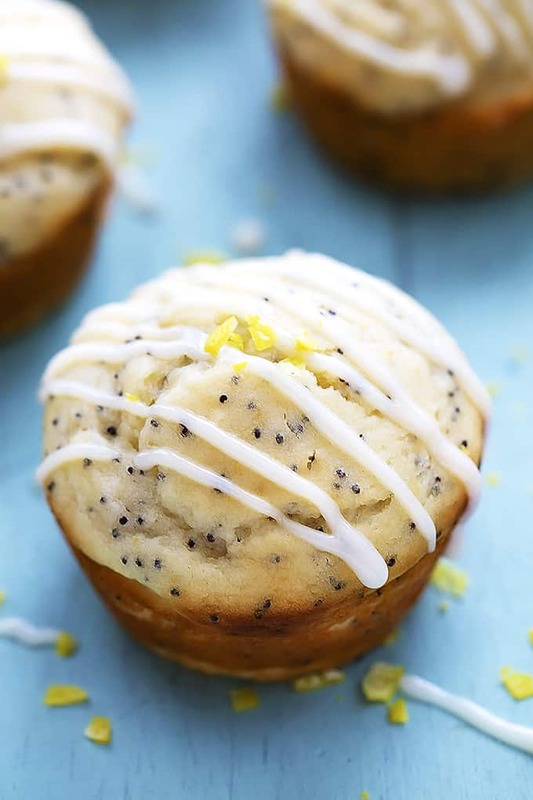 I love lemon and poppyseed these look so yummy I can’t wait to try this recipe. Thanks for sharing it. Absolute PERFECTION! These are SO yummy and incredibly quick to make! I made two dozen tonight, just because they are so quick! I’m a baker and ran across your beautiful muffins on a Google search. I baked them last night and was a bit apprehensive about the high bake temperature of 450. After about 10 minutes the bottoms were burnt and the muffins weren’t cooked throughout. I have a newer oven which is very efficient. It seems like the temperature should be adjusted to 400 or 375 with a longer bake time. I should have known better, but after reading through the comments, I thought I would try it out. If it’s an older recipe, cooking times and temps usually need to be adjusted accordingly due to updated technology. Thanks! I am making these muffins for a charity bake tomorrow. Can I just ask – for the batter – is the butter softened/melted when mixing it with butter, sugar, eggs, vanilla etc or just block of butter from package as is?? I’m making these delicious looking muffins in the morning and just realized I used up half of my Greek yogurt for dinner without realizing I bought it for the muffins! Would it work doing half oil [like olive or coconut] and the rest the Greek yogurt?? Came out great, but I added 1/2 tsp baking powder as well (compared with other recipes) and one extra tbsp lemon juice. The degrees is very high, I lowered it to 200 degrees C after about 8 minutes and at 12 minutes it was done-done. I just made these using the almond extract and I have to say Bravo! These are absolutely perfect!!! Thank you for sharing!! Can I substitute sour cream for the Greek yogurt? I cannot tolerate that type of yogurt. Thank you! After only 10 minutes mine were completely burned on the bottoms and sides. The inside was still delicious, but what a bummer! I wonder what a better temperature would be… going to try another recipe that suggests 425 for 5 minutes, then lowers it to 350 for an additional 10-15. Always love your recipes, but I wonder if this one’s really accurate? Hi Camila! I’m so sorry your muffins didn’t turn out! I adapted this recipe from my mother’s very very old collection and when I first read the cooking temperature I thought it must be a mistake but sure enough, they came out perfect at 450 degrees! Do you live at a lower altitude? If you do then you’ll need to cook them for less time 🙂. Fabulous!! I only leave comments if I make a recipe and this is really good. That being said, I only had sour cream not yogurt and I did make the frosting with less sugar just because I felt it was thick enough. These are special enough to serve for a special event. Loved these! I did not have any poppy seeds so I used Chia seeds (I added them at the very end just before baking) which worked out well. I baked a batch at night and because hubby was not feeling very well I froze the left overs to have during the week. Hubby was upset the next morning so I made another batch – this time I used more zest and a more lemon juice (I LOVE the Lemmon flavour) OMG the Lemmon flavour had a big punch which I LOVED! These were so tasty! The 450 made it a VERY dark brown crust so if I was bringing them to a party I would probably want to put icing on the whole top. They were crunchy and delicious though! I like that they are not overly sweet. Do not like Greek Yogurt- am substituting sour cream! I’m sure they will be delicious! How many muffins Deos your recipe make ? I used almond and vanilla flavors in it. It was perfect. Hi and thank you for sharing this delicious recipe! I had a hankering for some bakery, and lemon + poppyseed sounded like an answer to my craving. The 450 degree oven seemed high to me too, but you know what? It turned out perfectly! I didn’t have the time to do muffins, so I poured the batter into an 8 x 8 greased pan – that worked out really well. The thing I like about this recipe is that it uses BUTTER, rather than oil. Soooo delicious. When I made the frosting, it seemed thick after I added just two cups of powdered sugar, so I thinned it with a little lemon juice, left out the remainder of the powdered sugar and spread it over the poppyseed cake after it cooled. I think this would be a delicious icing if made with almond extract too. That’s what I’m going to try the next time! Hi Amy! So glad you enjoyed this recipe! It’s one of my favorites! The most addicting muffins ever! Moist and the cream cheese lemon icing is the perfect balance! THese muffins are incredible! I made them today and they came out perfect. I doubled the muffin recipe but made only one batch of icing which was more than enough, with lots of icing left over. Thank you for sharing this recipe. Big hit in my house. These were great! I didn’t have time to make the frosting so I just made a quick glaze with the left over lemon juice and 10x sugar and it was delish. I took a risk making these to take to a dinner paRTy. Flavor was great But they were so dry. Maybe i overbaked them but feeding all those ingredients to the garage disposal instead of friends was a bummer. Tried your Lemon Poppy Seed Muffins and YIKES. 12 minutes was way too long to bake at 450. The drizzle was crazy since the recipe said 3 to4 C of powder sugar. I had tons left over and didn’t like it all. Please be more accurate in your recipes. These look perfect! Making them tomorrow! Hope they turn out wonderful! I made these for a church supper and they were a hit! my husband cannot have poppyseeds, but loves lemon, so i made another batch omitting the poppyseeds and added blueberries. They were also a huge success! I had to leave them in the oven for a few extra minutes because of the moisture from the berries, but that was it! thank you so much for the wonderful recipe! this has been added in my “go-to” recipe collection! I just finished baking these at 450 for 12 minutes and they came out burnt :-(. My oven is correctly calibrated so I’m not sure whats wrong, but i’m super disappointed! I was hoping to mqqk these muffin for my sisters brunch next weekend. Do they freeze well? And is it okay to freeze them with the icing on or should I do the icing the day of? Hi Kate! A sister’s brunch definitely sounds like something I need to be doing with my sisters! I think freezing would be just fine but I don’t think you will want to freeze them with the icing already on them! I hope you have fun at your brunch and enjoy the muffins! Thanks so much for your help! I will either freeze them with the icing off or make them the night before. It’s my sister 20th, looking forward to an awesome brunch! I will let you know how it turns out. Hello! Just wondering if vanilla greek yogourt would work? Thanks! Hi thEre. Im planning on trying thIs recipe but I take iT that 450 degrees is in farenheit so maybe i should bake It on 230 degrees celciUs.. isnt this a bit too high .. if i bake at 200 do i still keep it in for 12 mins? These muffins were a huge disappointment. I think 450 was way too high and my muffins almost burned at 12 min. The icing amount was too High and consistency was too thick. I’ve made these in the past and they were amazing but I want to make them into larger muffins. Do I need to change the temp or cookng time so they come out as great? Hi Leeann- you shouldn’t need to change the temp but you may need to leave them in a few minutes longer! Hope they turn out great for you! Without a rising agent, these muffins cannot POSSIBLY rise but become too DENSE.baking powder was omitted from the list of ingredients and steps. Overall good flavor, just stodgy, due to more wet ingredients verses dry. If self rising flour is not used then both soda and baking powder is recommended when using All purpose flour. literally baked this minutes ago and tasted it. it was delicious and all the flavors that i expected are there, it was well balanced. thank you for posting this recipe. Happy to hear that your muffins turned out perfectly! Thanks, Melanie! Hi tiffany, i made The muffins and they turned out great. Can i make this recipe in a loaf? Hi Ana- I haven’t tried this but it might work although I couldn’t say for sure what the cooking time would be. Just trial and error! You could try my poppyseed zucchini loaf- the taste is very similar! I made the lemon poppy seed muffins. The baking temp was 450! Was that For real as my muffins weRe overdone! TheSe were delicous. I totally Tripled up on the amount of lemon juice but i dont think it affected the teXture poorly. Might Even add a bit more next time. 🙃 i was wondering if you knew the apprOximate amount of cAlories per muffin? ThanK you! Hi Gabrielle! I bet the extra lemon was a great addition- good job! I don’t have the nutritional information for this recipe but if you use MyFitnessPal… they have an awesome tool where you can input any recipe URL into and it will generate all the information you’re looking for! These were so good! I made mini muffins and they turned out perfect. I ended up not having cream cheese for the frosting so i made up a lemon glaze. Thanks for sharing! Great job, Eliza!! I love mini muffins 🙂 Super excited to hear that they turned out great. Nice thinking with the lemon glaze! Just made these with my son. They are absolutely delicious!! Great job!! Super excited to hear that you and your son loved these muffins! Very moist and yummy! I doubled the recipe and the first batch burned on the bottom at 450. Second batch i lowered the temp. No need for icing! Fantastic!! Thanks for your feedback, Leslie! even though I am 11 years old, baking is life and I love to bake muffINS. i’M PRETTY GOOD FOR MY AGE. Have you ever froze muffins and pulled out just what you need?